The 2013 Ram 1500 took the industry by storm with a refreshed exterior, a refined suspension system and the powerful Hemi drivetrain – easily making this one of the best half ton trucks on the marketing and showing that all of those awards handed to the Ram team over the past six months weren’t just the result of marketing fluff. While a great many of the “truck of the year” awards of late have gone to vehicles that may offer great capabilities, the bottom line is that they simply aren’t trucks but with almost everyone picking the 2013 Ram 1500 as their truck of the year – we finally have a true pickup truck serving as the top truck in North America. My test vehicle was a 2013 Ram 1500 Laramie 4x4 with the 5.7L Hemi V8 and the 6-speed automatic transmission. Options include the Mopar chrome side step bars, a premium sound system, the active level air suspension system, the trailer tow package and the RamBox cargo management system with a resulting price of $50,865. 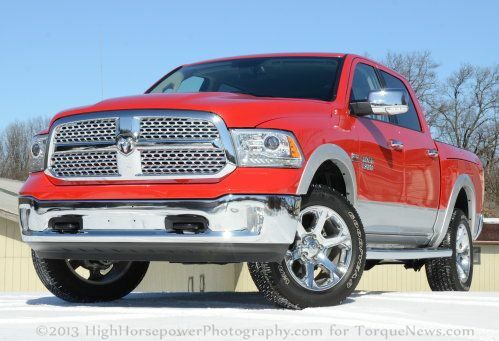 The Laramie trimline for the 2013 Ram 1500 is just one step from the top of the line with an exterior that presents a very upscale design with a ton of chrome from front to back and top to bottom. This begins up front where the big, bold Ram crosshair grille is filled with new chrome inserts that almost give the nose a solid chrome look with a large chrome Ram crest at the intersection of the grille crosshairs. This luxury look is bolstered by the high tech LED and projection headlights mounted in chrome bezels and an entirely chrome front bumper. Along the sides, the 2013 Ram 1500 Laramie features chrome 20” wheels, chrome side steps from Mopar, chrome door handles, chrome mirrors and a silver trim on the wheel flares and along the bottom of the vehicle that connects the front and rear bumper. As part of the RamBox Cargo Management system, both bedsides feature the handy RamBox storage compartments that feature locks that operate with the electric locks from the key fobs. The RamBox compartments are great for those who want to tuck away items in the bedsides and keep them both dry and secure without having them slide around in the bed. Mopar sells racks that can mount in to carry fishing poles or gun racks but in standard form, the RamBox can haul a variety of goodies. It can also serve as a cooler with drains at the bottom to get the melted ice out when you are done chilling your favorite beverages. The back of the truck caps off the luxurious package with a big chrome bumper, a set of fuel 3 inch chrome exhaust tips and a massive chrome Ram created mounted in the middle of the tailgate. Joining the LED taillights up front is a set of large LED taillights that look great both day and night. When you open the tailgate, you find the next phase of the cargo management system which includes aluminum rails with adjustable tie downs and an adjustable cargo barrier that locks into the groove in the bedside. If you are a truck driver who is sick of having your cargo slide around in the bed, this cargo management system helps keep smaller boxes in place while the adjustable tie down system takes the guess work out of securing your load. The 2013 Ram 1500 Laramie looks great with tons of chrome creating a very upscale look but the addition of the LED and projection lighting, the slick aerodynamic properties and the functionality of the RamBox system make this truck every bit as functional as it is good looking. While all of the chrome and the two tone paint on the outside of the 2013 Ram 1500 Laramie goes a long way in bolstering the luxury feel, the real luxury comes on the inside. A two tone leather package puts dark brown leather on the dash, door panels and steering wheel with light beige leather on the front and rear seats for a very high end look. This dark and light brown layout is continued through the rest of the dash, the door panels and the carpeting wood some scant wood and chrome trim scattered throughout. The plush leather front seats of the 2013 Ram 1500 Laramie offer full power controls with both heated and cooled seating surfaces so not only are these seats comfortable in all climates but they also allow a ton of adjustability so drivers both tall and short can make adjustments to drive comfortably while the adjustable pedals do the rest. A large center console makes for a nice, comfy arm rest but underneath is a roomy storage compartment that is joined by not one but two glove boxes and door pockets to offer as much space to stow things as any truck on the market today. Out back, more plush leather provides a comfortable seats for three passengers or two passengers with the center seat folding into an arm rest and cupholder. Also, the 60/40 split rear bench design makes for more cargo space of tall items with yet another storage space under the driver’s side rear seat (there is a subwoofer under the passenger’s side rear seat). Whether you sitting up front or out back – this is a truck that allows tons of leg, elbow, head and knee room for four large adults with space to stow plenty of drinks and other smaller items. In terms of technology, the 2013 Ram 1500 Laramie is packed to the hilt and that begins with the huge infotainment screen mounted high in the center stack. This 8.4” touchscreen controls the climate control, the navigation system, vehicle settings and the sound system while traditional knobs and buttons are available for those who prefer to avoid the touch screen. Also, the steering wheel mounted controls allow the driver to adjust the sound system, the cruise control or the Bluetooth phone system without taking their hands off of the heated steering wheel. In addition to two normal car charger plugs, there is also a 110 line so you can power any items with a traditional wall plug right in your truck. Finally, the customizable driver information screen that is mounted between the large tachometer or speedometer provides constant information on things like outside temperature, time, suspension setting and a variety of other vehicle parameters along with the standard gauges like fuel level, engine coolant temperature and transmission temperature. When you talk about loaded up luxury pickups, the 2013 Ram 1500 Laramie Crew Cab is one of the best on the market with a roomy, comfortable interior and all of the high tech gadgets that a buyer could want from a modern pickup. This is a truck that has everything so whether you are driving to the work site or driving across the country – this truck is all about comfort between the doors. The feature of the 2013 Ram 1500 Laramie that stands out the most is the inclusion of the new active air suspension system which allows the driver to select the ride height of the truck. There is standard ride height, off road 1, off road 2, a entry/exit mode and aero mode with the first four being selectable by means of two buttons mounted on the center stack. When the truck is parked, you can toggle between those first four modes with the entry/exit mode making for easy loading while the two off road modes offering vary lifts with off road 1 raising the truck by a little over an inch while off road 2 lifts the whole truck by a full two inches. This essentially provides the advantages of a lift kit setup without any modifications and while two inches doesn’t sound like much, it makes a big difference when digging through deep terrain. It should be noted that unlike aftermarket air ride packages, you cannot just drive around in the different suspension settings. When you set the vehicle to either entry/exit mode or off road 2, once you break 25 miles per hour the suspension returns to the factory ride height setting but when you are driving at low speed (such as when offroading), you can shift into the off road suspension settings while in motion. However, the fifth and final mode – aero mode – engages automatically when cruising on the highway to help improve fuel economy figures. While the efforts made to improve the fuel economy of the 2013 Ram 1500 wont make any hybrid owners blush, the real world fuel economy figures of 14.9 miles per gallon over the course of several days of unladen driving was just a tenth of a unit away from equaling the projected “average” fuel economy figure while gentle driving on the highway showed that the EPA rating of 19 miles per gallon is very realistic on a long highway drive. My 2013 Ram 1500 Laramie 4x4 was powered by the 5.7L Hemi V8 with 395 horsepower and 410lb-ft of torque so it should go without saying that this truck packs some serious get-up-and-go. This drivetrain makes the Ram 1500 one of the quickest half ton pickups on the market today while also being among the most capable – with a towing capacity of 8,400 pounds and a hauling capacity of 1,245 pounds with the standard 3.55 gears. Even with the relatively small 3.55 gears (3.92 gears are also available), the Ram Hemi puts you back against the seat in a hurt when you hammer the throttle and climbs effortless towards the century mark on the speedometer. Even with the gentle shifts and the conservative gearing of the 6-speed transmission, the Ram 1500 with the Hemi is one of the quickest trucks available so if you are in the market for a half ton truck that can outrun a great many of the cars on the road today – look no further than the Ram 1500. When the Chrysler Group announced that they would be running the air suspension setup, many long time truck owners questioned whether the innovative suspension system in the 2013 Ram 1500 would be able to handle the rigors of towing and hauling so to test these abilities, I hooked our test vehicle to a 4,500lb horse trailer and went for an average ride around town and on the open road. I have done a great deal of trailering in my days and the air ride suspension system in the new Ram 1500 performed as well as any other stock truck that I’ve tested with that same trailer. The Ram handled well around town in tight quarters and at higher speeds on the highway without any excess harshness or bounce to the truck and trailer combo. The integrated trailer brake allows for full controls of the braking system with the buttons on the center stack so those who don’t want to deal with the hassle of adding an aftermarket trailer brake controller can cut out the middleman in a perfectly integrated system with both sensitivity settings and manual braking controls. The 2013 Ram 1500 pulled the trailer just as confidently as any truck Ive driven with traditional leaf springs so those who want the versatility of the new Ram air suspension setup without losing the ability to tow don’t have to worry when buying a new Ram 1500. Best of all, when driving the 2013 Ram unloaded it offers solid handling and a nice, smooth ride that you don’t get from some of the competition. The Ram 1500 Laramie is a luxury truck that offers a smoother ride than you would expect from a truck that can comfortably hit the trails or pull a 8,000+ pound trailer. Whether you want to go fast, pull a heavy trailer or haul a bed full of cargo, the 2013 Ram 1500 can go tow to tow (see what I did there?) with any truck on the market and hold its own. There is no question why Motor Trend and so many others named this their best truck of 2013 as with the active air suspension and Hemi power, this is one of the most capable and exciting trucks on the market. Once the 8-speed transmission (arriving in dealerships now) is in place, the Ram will likely offer better acceleration and improve fuel economy figures so a great truck will only get better. While some “Truck of the year” awards seem a bit farfetched, the 2013 Ram 1500 is a real pickup that can outperform pretty much any truck in the segment in an overall comparison. While others might offer more power, more capabilities or better fuel economy – no other half ton truck is so good at pretty much everything. Add to that power and capability the fact that the Ram 1500 is the only half ton pickup on the market with factory air suspension and an interior layout that is deserving of the “luxury truck” designation - and you have a pickup that can be everything to everyone. If you make a list of all of the features and capabilities of the 2013 Ram 1500, no other truck can offer as complete of a package as this new Ram. It is really no wonder that this truck has claimed so many awards for the 2013 model year so if you are in the market for the best new truck on the market – look no further than the new Ram 1500.